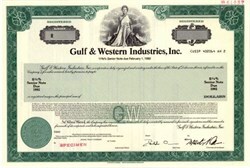 Beautifully engraved specimen certificate from the Gulf & Western Industries, Inc. This historic document was printed by the Security-Columbian United States Banknote Company and has an ornate border around it with a vignette of an allegorical woman. Paramount Communications is the new name of Gulf & Western after the conglomerate sold off its non-entertainment businesses.